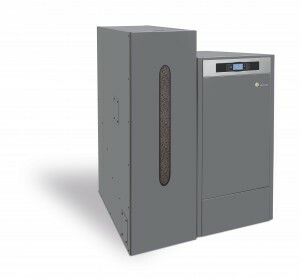 Thermsaver can offer a biomass range of boilers (9kW – 84kW). The simple design allows customers committed to renewable energy, a competitive alternative in biomass technology. The range is designed for use without the need of controllers, this keeps the cost sensible without losing any of the efficiency. The German/Austrian market have become synonymous with biomass design and technology, but these designs often come at a high price. Our design offers quality, innovation and efficiency without it costing the earth. Competitively priced, our range is a simpler/sleeker alternative in biomass technology. The range doesn’t require difficult installation, is self-cleaning and easy to maintain and use. Our biomass range could also qualify for the Government’s RHI payment. The pellets used in our systems form part of a mechanised operation system that allows automatic fuel feeders to refill the burners at regular intervals. This allows automatic operation in much the same way as an oil or gas boiler would.